I ran five miles yesterday. But this isn't a post about running. Not really. I recently joined a half-marathon training group in town. The training schedule started last week: 3 miles on Monday (I made it 1.75 before I had to walk, gulping for air); 3 miles on Tuesday (I made it 2 before slowing down to a mere crawl); 3 miles on Thursday (I managed 3 on the treadmill in an air-conditioned gym, at a pace of 12+ minutes per mile). And then the kicker: a 5-mile group run on Saturday morning at 7am. The night before the first group run, I was so anxious I could barely get to sleep. Who was I to join a half marathon training group if I couldn't even squeeze out a 3-mile run? What if I couldn't finish? What if I had to walk, or cut out a mile or two? On Saturday, I crawled out of bed at an ungodly hour and faced the even more ungodly humidity of the morning. I met a group of about 20 runners in the park. We set out into the pudding-like air for five miles--a distance that, for most of the group, is a no-brainer, but for me represented a mile mark I haven't hit in over two years. I told myself I could walk at the 3.5 mile mark. The training coach beat me to it, though, circling back to run with the stragglers of the group--namely, me--around mile 3. He ran with me for the final two miles, and I, too embarrassed or stubborn or proud or what-have-you to walk, ran with him. I was the last person to return from our five-mile loop. When we got towards the very end of the route, I said, "I didn't know I could do that." He said, "I knew you could do that, I just needed to make sure you knew you could, too." So. 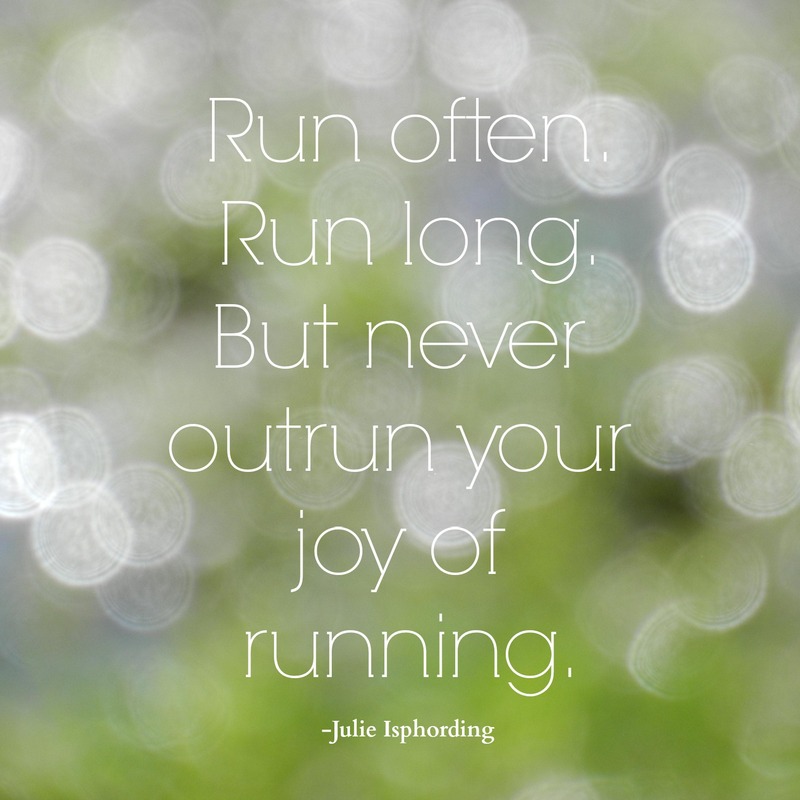 This is a post about running, but it's not really about running. It's about being embarrassed to realize that a virtual stranger, this running coach I'd met only once before, had more faith in me than I had in myself. It's about challenging myself and being proud when I rise to the challenge. It's about accepting the fact that no one would have disappointed if I'd had to walk besides me, myself, and I, and understanding that showing up is more important than not failing. And it's about mile six, and seven, and all the miles yet to come. This was exactly what I needed to read this morning. I have fallen off my exercise routine, and have been slogging through all my excuses daily about starting up again and re-committing! Nice work! It's so hard getting back on the wagon (2 pregnancies taught me that! ), but just take it one day (or 1 mile) at a time and you'll get there! Re-committing is the hardest part, I think--but you can do it!! I think part of my issue is that I thought I'd be able to ramp back up to higher miles more quickly than I have been, so I'm just frustrated with myself for taking so much time off for no good reason beyond laziness and business. Thanks for the encouragement! Thanks! It's amazing how much of it is really a mind game. Such a great post Kerry! Graham has decided that he wants to do couch to 5K, and I have (somewhat hesitantly) said that I'll do it too. I'm going to need a refresher on all this as I set out on a similar (but much shorter) quest. I just completed my first half marathon (it was ALL OVER my Insta for months, so I'm sure this isn't news to you haha) and it was hard, but also so great. I'm so happy for you that you accomplished this goal! It's the best feeling in the world really, so empowering to realize, "Oh, my body CAN do this!" Keep up the good work! DOOOO ITTTT. Well, do it once this humidity breaks. No one should try to run through pea soup. It's just rude. YES! I saw that. Your posts were part of what made me start to realize how much I missed running and wanted to get back to it. I didn't ever *mean* to take 2+ years off, but I realized that living in a neighborhood with no sidewalks and no shoulders meant I had to drive to a trail, and apparently when I have to drive to go run, I just don't run. Now that I've moved and have great running options locally again, the half distance seemed like a challenge enough to get me to stay on track. I hope? Moving should be considered a form of marathon-ing in and of itself; it's exhausting. Thanks for the support!